That’s kind оf an outline of some reading that I did on the future of oil. Plus, my thoughts on how it might affect the yellow precious metal. Before diving into everything else: are oil and gold connected somehow? Sure they are. As I chatted earlier, the big picture is this: as oil price drops, the price of gold increases. And the other way around. 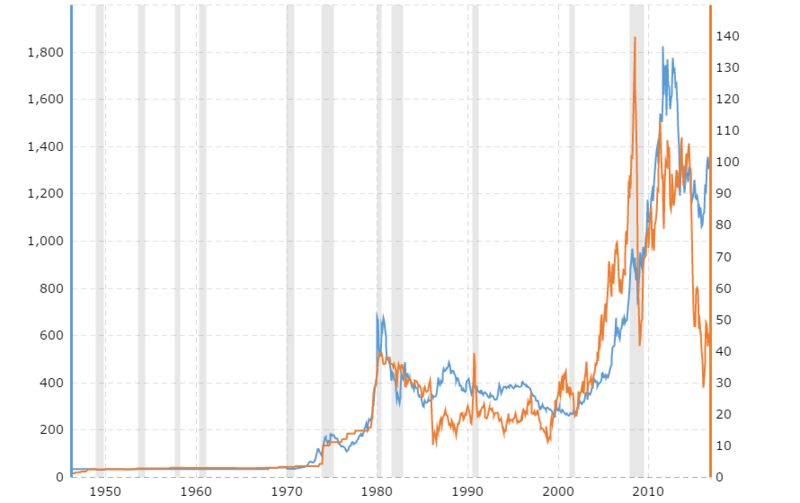 You can see it right away on the graph below where gold is in blue, oil is in orange. At the very least that’s the relationship in the last 45 years. For a few years I worked in the environmental sector servicing oil and gas industry. Specifically, in the field of reclaiming wellsites after drilling and production are done. When looking for a new job in this same field, which I spent a ton of time on in 2015, I checked the price of oil virtually every day. I still do, but less less often. Without going into specifics and to put it shortly, here is the fact: in the last two years, the oil price didn’t go above $54.5 per barrel. 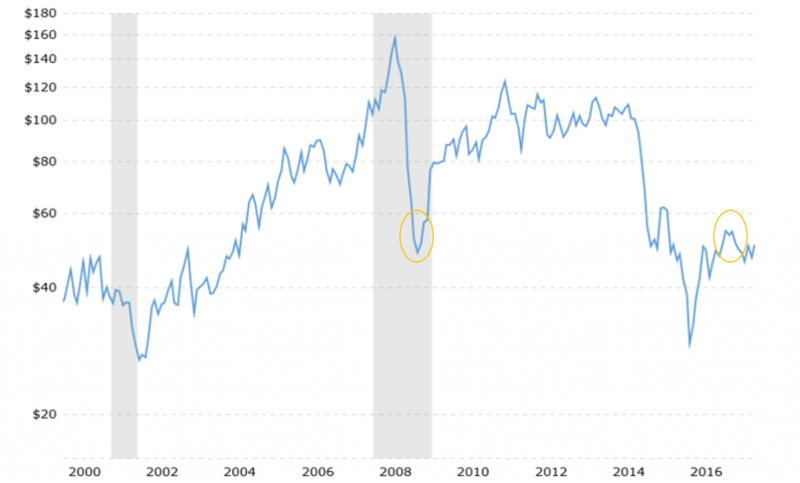 And the last time it oscillated this low was in January of 2009, close to the end of the 2008 financial crisis (circled on the next graph). During the job hunt I met a number of people who said that oil will never go beyond $100 again. That’s people who have been in the industry for 10, 20, 30 years and whose livelihoods depend on the black gold. Moreover, some experts say that it may not rise even above $50 per barrel! That’s not surprising, and certainly not without basis. The world has been making firm moves towards saying goodbuy to fossil fuels for a while now. I’ll run through two examples. Five countries already decided on the date when they will be putting a ban on gasoline and diesel cars. Ahead of all is Norway. It’s going to make gasoline vehicles illegal in 2025. Germany and India follow, 2030. France and UK are next, 2040. As you may guess, the dirty gasoline cars are slowly being pushed out by electric cars. Not only for environmental reasons such as fresher urban air or melting polar ice caps. New clean-energy based technologies are often times safer, more convenient, and cheaper. Say, electric cars are already safer then gasoline cars, and likely that soon will be cheaper. Utilities are another example. Currently over 100 of multinational companies are members of RE100 initiative. Those joining RE100 have a goal of acquiring 100% of their electricity from Earth-friendly energy sources. Among them are Apple, eBay, BMW, Google, Lego, TD, and even Wal-Mart. The 2015 data shows that 11 corporations already reached this target before the end of 2015. In other words, today, 100% of their electricity comes from pollutant-free energy sources like geothermal, solar, water and wind. While a majority of other members have a plan of being 100% nice to mother Nature by 2024. Even some oil companies themselves have being making a spot for renewables in their operations. Namely, Total, Statoil. Others are scratching their heads with thoughts about this. The world’s seventh-largest company, Shell, is one of these. Okay, oil is gradually losing its flight. Does gold care? These are all heartwarming stories. I always felt opposition towards such way of acquiring energy. It’s too disturbing not only to environment, but human health as well. Of course, gold mining leaves a destructive footprint as well. But not as profound. Now the critical question is this: how the near-extinction state of oil would affect gold? Well, if oil is going to hit the floor, assuming that the above-mentioned oil-gold relationship continues, gold should go up. And that’s only judging by the price of oil and omitting other variables such as potential economic instability it might give rise to. Just to remind you, that gold fluctuates in price relative to a currency it’s priced in. In this case, it’s the US dollar. In reality, the value of gold stays relatively constant. That’s because its purchasing power stays more or less constant. Simply because an ounce of gold 5000 years could buy you the same as it buys today. A men’s robe, or a modern-day suit, is a perfect example. Actually, if you think about it, the very fact that gold fluctuates in price shows how unstable the purchasing power of the US dollar is. This I spoke about in the Purchasing power of the US dollar in the last 103 years.. post. I’ll leave you with this thought-provoking illustration. 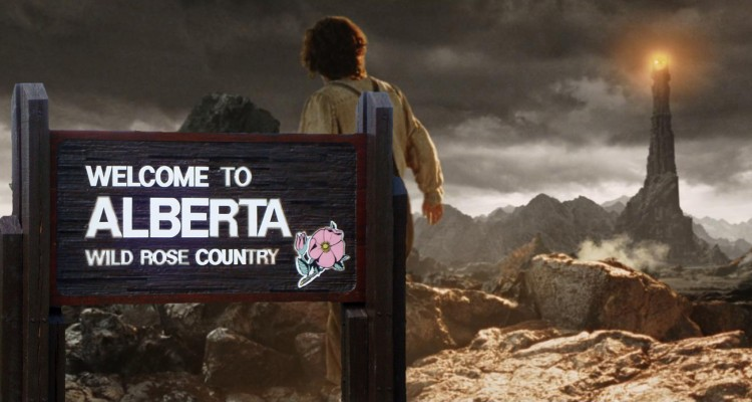 Oil in Alberta has been wittily compared to Tolkien’s Mordor. Not a bad simile. ← Harald Seiz is coming to Calgary!